Office: 800-401-8994 x 703 Direct: 714-361-2105 | ... See More C 714-475-8629 ? The Power Is Now Mortgage Services is a Mortgage Brokerage licensed by the State of California Bureau of Real Estate (license #1980407) and the National Mortgage License System and Registry (license #1435243), and is a division of The Power Is Now Inc. (license # 01980407). The Power Is Now Inc. is not affiliated with any state or federal agency. The Power Is Now Real Estate Services is also licensed by the State of California Bureau of Real Estate (licensed #01980407), and is a division of The Power Is Now Inc. The Power Is Now Inc., is an equal housing lender. 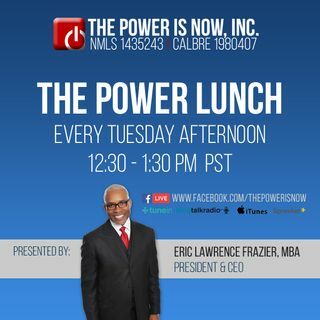 Eric Lawrence Frazier MBA, is a California licensed Loan Originator (NMLS license # 461807), and a licensed Real Estate Broker (CA Bureau of Real Estate license #01143484). Restrictions may apply to all loan programs. The Information and/or data is subject to change without notice. All loans are subject to credit approval. The information presented is not a commitment to lend or extend credit. Not all loans or products are available in all states. The Power Is Now Mortgage Services and Real Estate Services are A Division of The Power Is Now Inc., and are only licensed to conduct business in the State of California.